Massiv XI, the Mecca of Football Lovers, brings you their star-studded Massiv 5-a-side tournament on 30 November 2018. Legendary footballers Jabu Mahlangu, Mark Fish, Christophe Bongo and the first lady of Massiv XI, Tumi Kgasoe will be getting down and dirty and bringing you a celebrity studded affair at the Discovery Soccer Park in Illovo. 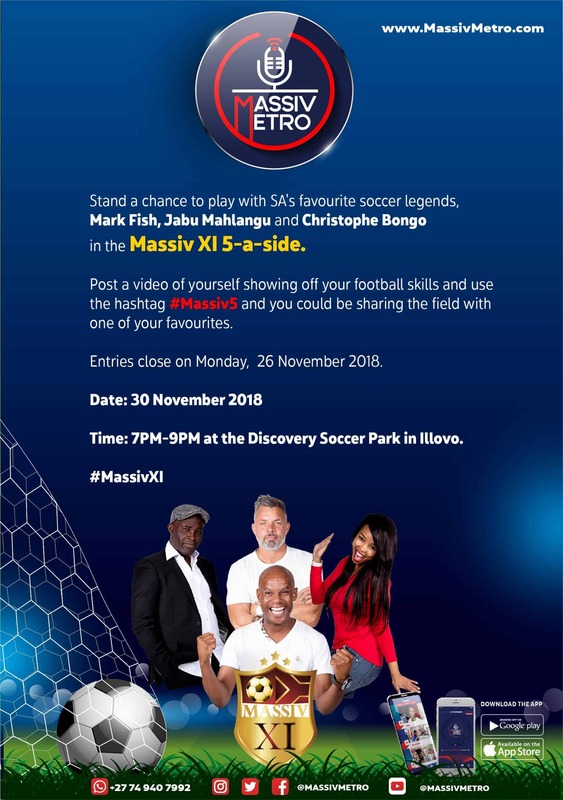 You could also be a part of the action and play alongside your favourite soccer superstars and other celebrities by uploading a video of you showcasing your soccer skills to social media; and tagging @MassivMetro with the hashtag #Massiv5. Jabu, Christophe or Mark could be picking YOU to join their 5-man team as they go up against each other and Tumi’s celebrity team from 7-9PM on 30 November 2018. Entries close on Monday, 26 November 2018 so you better get moving! Tune in to #MassivXI every Weekday from 18:00-19:00 CAT and on Saturdays 09:00 – 10:00 CAT for the latest in your football news, events and analysis.